On 23rd June, UK voters will decide whether they wish to remain in, or leave, the European Union. Opinion polls suggest that the referendum is likely to be a close-run contest. As the dust starts to settle on the day after the vote, join LGIM’s asset allocation team at 3:30pm on Friday 24th to discuss the impact and implications. 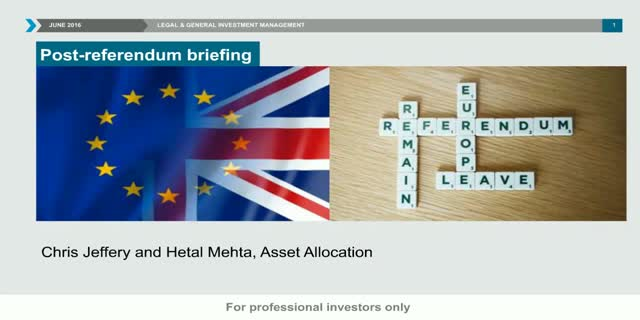 Hetal Mehta, our UK and European economist, will outline her economic roadmap for the UK over the months ahead. Chris Jeffery, one of our asset allocation strategists, will focus on the initial and prospective market reaction.